People love celebrities. We like many things about them, we even like their teeth! 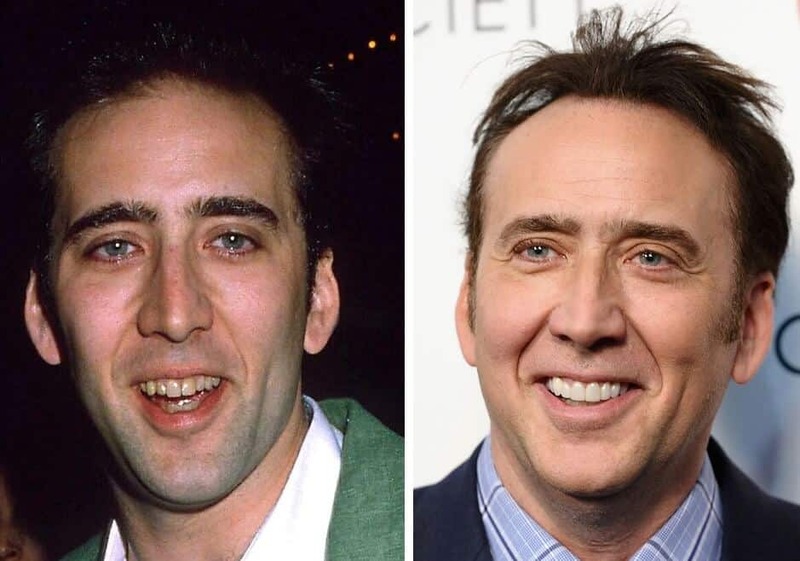 Celebrity teeth and before and after celebrity dental makeovers are very popular and many people want to see before and after celebrity dental work. Whether its braces, invisalign, tooth whitening, veneers or even implants – the before and afters of celebrity teeth can be astonishing! I thought I would combine some of the best celebrity dental work to help celebrate the important effect a nice smile can have on even an already famous face. 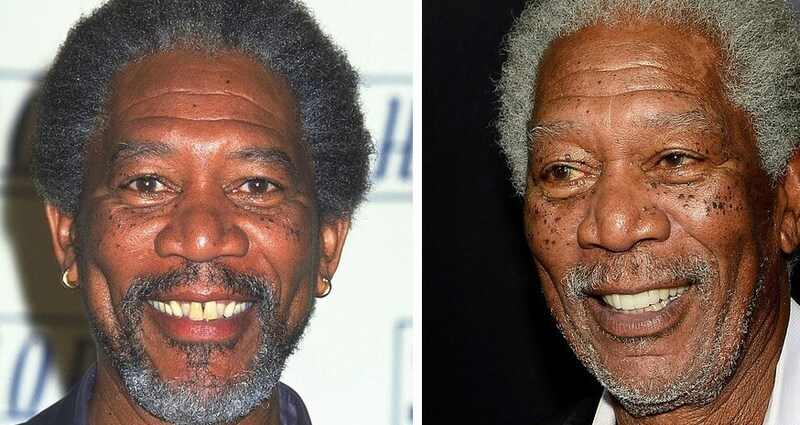 The extraordinarily talented Morgan Freeman has always had a dynamite smile. The improvement in alignment shape and colour of his teeth over the years has improved his already great grin! Love the central incisors (front teeth) improvement in shade and shape. Also impressed with how the crowding has been improved. Niall Horan before and after dental work and braces. Niall grew up in the spotlight and like it or not everything he did became headlines for kids around the world. He inadvertently became a positive role model for kids who need braces. 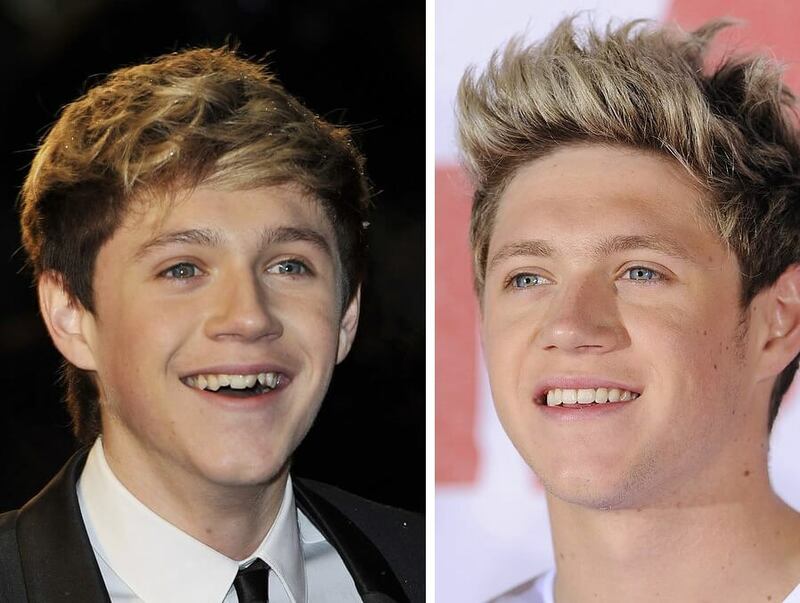 Bravo Niall and congratulations on the awesome teeth outcome. They look natural but quite perfect. He is reportedly an invisalign alumni. Nicholas Cage has dominated headlines for many years. His career has ups and downs but the magic man has always had his every improving smile. Love the effort that he has put into redefining his smile and reshaping and whitening his teeth. Good hustle Nick. The hundred million dollar man who has a legion of fans. 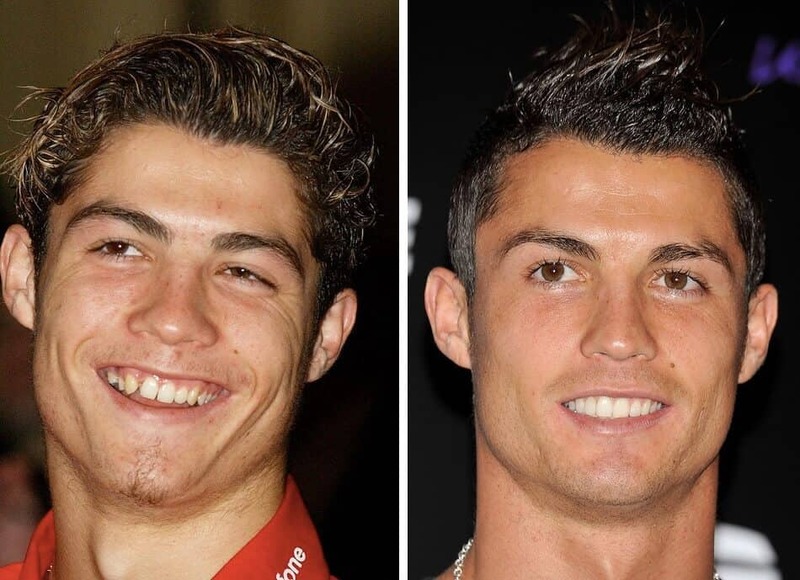 The pictures speak volumes here, Ronaldo drastically improved his smile by investing time and effort into his smile. Teeth are an important part of his look, and few others could pull off the incredibly white smile he has. In fact I would heartedly recommend most people don’t go for his shade of white – only he can full it off so well! 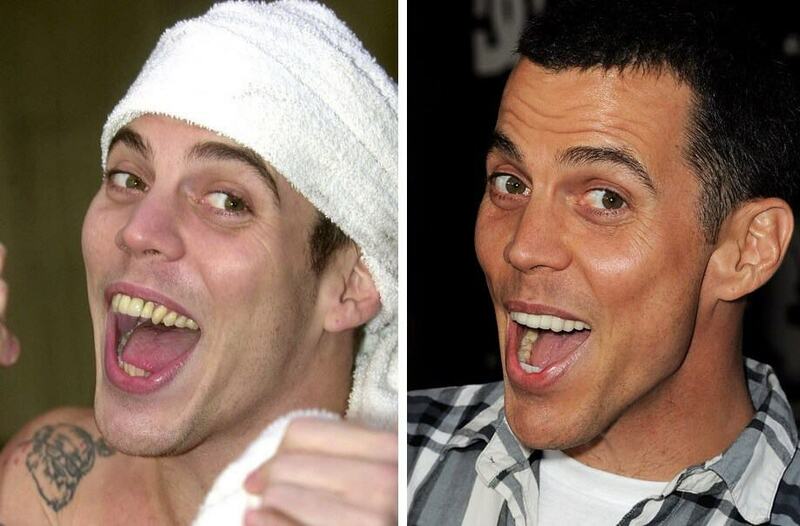 Jackass fans will know just how much the stars of the franchise have punished their bodies. And that includes their teeth! The bone and teeth crunching antics as well as the partying when not filming make a dangerous combination. Steve-O has a dynamite smile these days, and it is great he has put so much effort into getting veneers and crowns to improve his smile. Keep ’em shiny Steve-o! 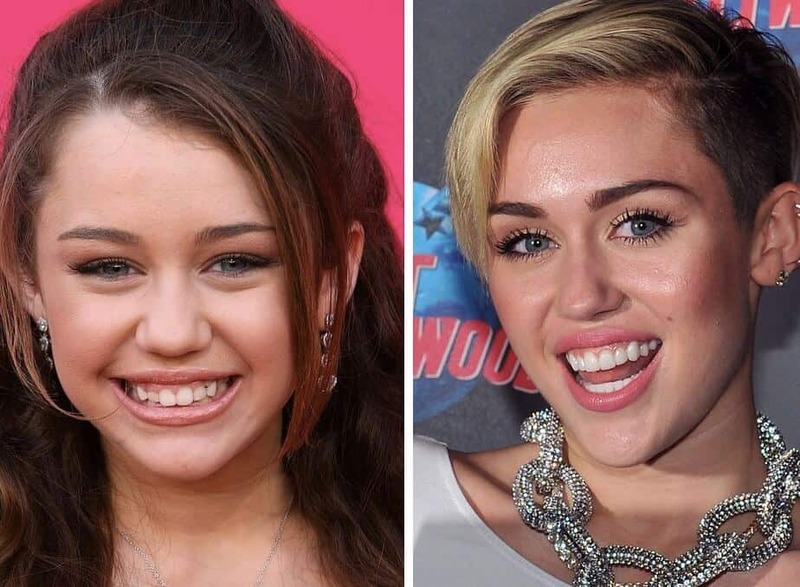 Speaking of growing up in the public spotlight..
Miley Cyrus has teeth that photograph ridiculously well. Veneers? Probably. Braces? Likely. Whitening? Surely. Either way the combination works and she has one of the best before and after celebrity teeth smiles out there. What do you think? Know any celebrities with epic celebrity smile makeovers? Comment! Dr Kit is an Australian dentist who loves to talk teeth. From root canals to toothbrushing, veneers to flossing – teeth are fascinating! He actively treats his patient base full-time in a General Practice setting. Comment any questions! Can You Straighten Teeth Without Braces? Does Invisalign hurt? Do invisible braces hurt like normal braces? Nice selection of celebrities. It serves as a motivation for those who need treatment. He does have an impressive set of teeth (/crowns) ! What Do Tooth Numbers Mean?